Through cosmic alignment more than cerebral intent, I have been thinking a lot about the reintroduction of 'Supergirl' to the post-Crisis, Byrne-era DC Universe. Much of that probably was born from my recent review of what I will call 'Matrix' in Superman #19 . In looking back at the site, I realize that I also briefly touched on her third appearance in Superman #20, the first time that Matrix met Ma and Pa Kent as she was trying to work her way through her muddled 'pocket universe' memories. 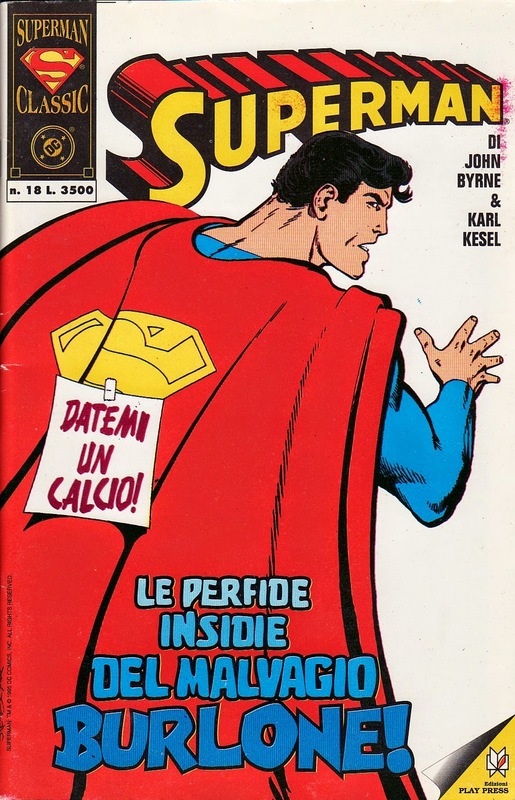 Heck, I've even covered the John Byrne promotional poster. 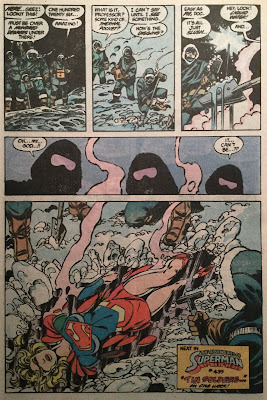 But before I get there, I figured I better cover the first appearance of Matrix in the DCU, as seen in an explosive cliffhanger in Superman #16. And I have to say I have a little movie-based theory about this first meeting. As many know, I was lucky enough to meet Byrne at this summer's Boston Fan Expo and got some issues signed including this one. 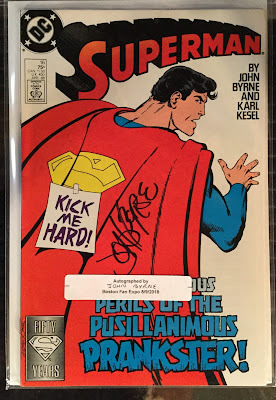 I thanked him for 'somewhat' returning Supergirl to comics and he shrugged and said 'somewhat'. And that little interaction meant a lot to me. We start out in Antarctica where a research base keeps getting readings of heat underneath the ice. It doesn't make any sense for something that hot to exist at the bottom of the world. So in their helicopter, a team goes out to investigate. Now any horror movie buff, especially one in the 80s, should get a little shiver of similarity here. 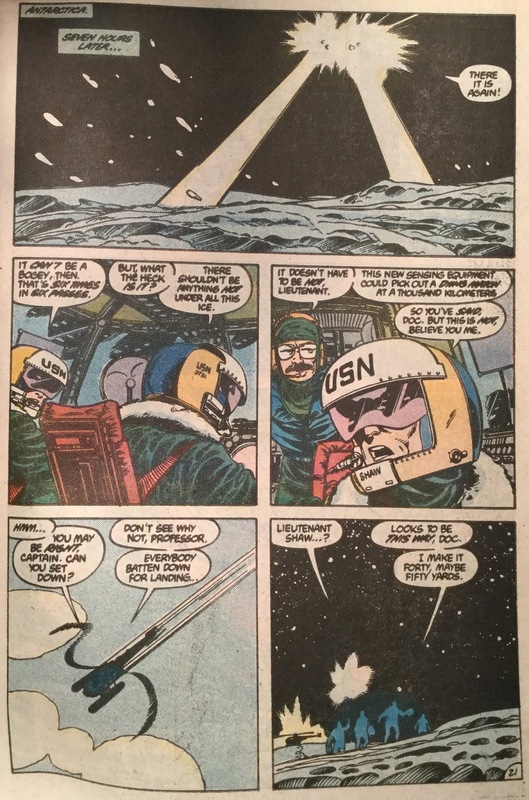 After all, John Carpenter's The Thing is set in Antarctica where a bunch of researchers dig up something alien, something with the power to look like us and be a perfect duplicate. 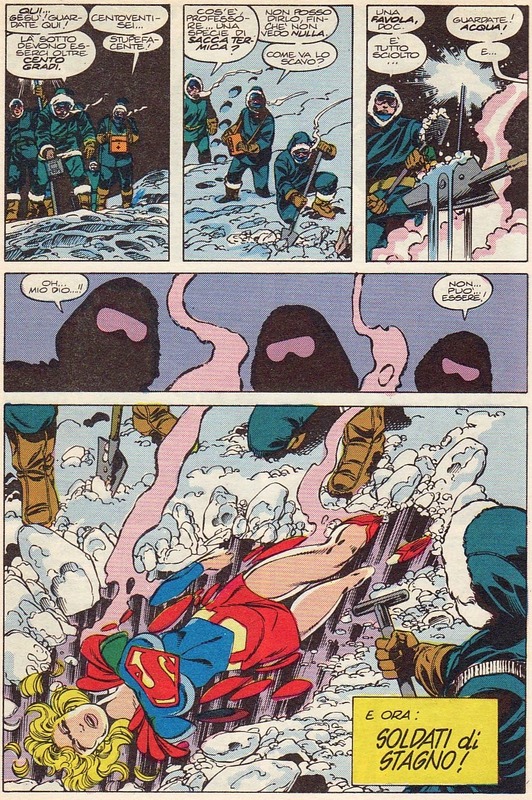 I can't help but think that Byrne was tapping into that here, perhaps giving us a hint that this wasn't truly Supergirl but a thing that only looked like her. Heading out into the ice, the team comes upon the site where the heat is emanating. With little effort (after all, the heat has made the ice turn to slush and water), they uncover what is causing the heat. It's a woman in a Superman outfit. Notice the legs. It isn't the blue leggings I marveled at in Superman #19. You can only imagine what Supergirl fans were thinking back then. Heck, I didn't know what I was thinking. Other than I immediately loved this new costume. 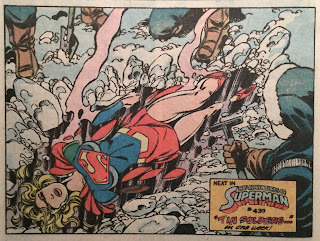 While I don't think it all turned out the way Byrne wanted (apparently Roger Stern did a lot of the heavy lifting in filling in Matrix's ultimate destiny), I have to thank him for getting a Supergirl back into the mix. I've shown this before but worth another look. Friends and family know when they travel abroad that I love getting comics in other languages. A while back my parents went to Italy and got me the Italian version of Superman #16. Here is that famous last page one more time! I'll figure out when to cover the 'Supergirl Saga'. As I said, I have been remiss in other homework assignments. But at least the teasing opening glimpses of her have been covered in detail. "I thanked him for 'somewhat' returning Supergirl to comics and he shrugged and said 'somewhat'. And that little interaction meant a lot to me." 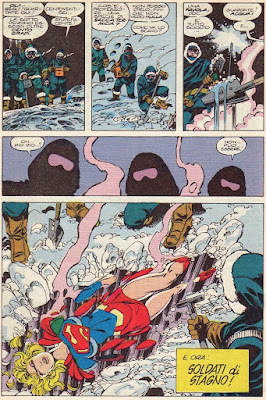 Happy to hear your meeting went well, but Byrne definitely didn't bring a Supergirl back because he cared. He has long stated he hates derivative/legacy/counterpart characters and hero families (except for She-Hulk for some reason), and it was up to him, he'd remove all characters that make the original less unique. "Now any horror movie buff, especially one in the 80s, should get a little shiver of similarity here." Definitely. I mean, I'm not a movie buff but it definitely brings "The Thing" to mind. "You can only imagine what Supergirl fans were thinking back then. Heck, I didn't know what I was thinking." As I recall, because I was reading this arc with great interest, the old letter columns were full of slightly plaintive missives on the order of "Please let it be her!" As pointed out above, this issue obviated the notion that Supergirl had no fanbase, the mere existence of said Supergirl fanbase has either infuriated or confused DC down to the present day. I recall being glad that "A" Supergirl was back but from the git-go I knew they'd radically alter the origin and I was right, creating an even more convoluted origin than the much derided "city in space" narrative circa 1959. The problem with creatives like John Byrne is that they spring out the ranks of fandom and the critical community that surrounds fandom and while that makes them passionate storytellers they can only operate at peak creativity on behalf of characters they like. 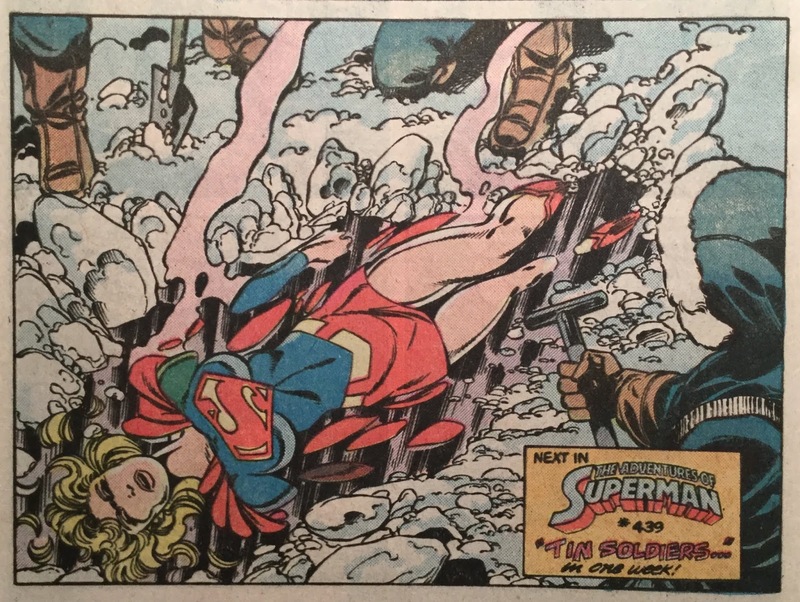 "As pointed out above, this issue obviated the notion that Supergirl had no fanbase, the mere existence of said Supergirl fanbase has either infuriated or confused DC down to the present day." DC has never known what to do with Supergirl, and they have left her fanbase dwindle away rather than pleasing us. "I recall being glad that "A" Supergirl was back but from the git-go I knew they'd radically alter the origin and I was right, creating an even more convoluted origin than the much derided "city in space" narrative circa 1959." Yes, and convoluted origins would be the eventual downfall of all non-Kara Supergirls. DC doesn't care for Supergirl but they DO care for keeping the trademark AND marketability, and "Superman's cousin" is infinitely easier to adapt to other media than Matrix and the like. 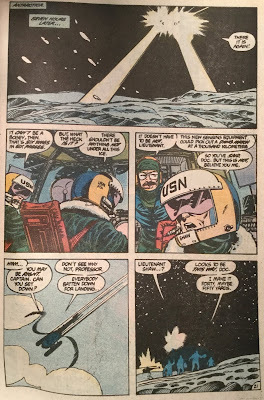 "The problem with creatives like John Byrne is that they spring out the ranks of fandom and the critical community that surrounds fandom and while that makes them passionate storytellers they can only operate at peak creativity on behalf of characters they like." Agreed. I find funny how Byrne complains about "fans-turned-pro" changing characters to suit themselves when he is a fan-turned-pro who changes characters to suit his needs. "So its probably just as well he never followed thru on Matrix etc, likely he'd a killed her off as well...."
Anj, I'm happy to hear "Elseworld's Finest" and the movie are finally in the queue, and I look forward to read your thoughts on "The Supergirl Saga", but I may also suggest other Supergirl origins such as AC #252 and "The Supergirl from Krypton"? And "The Unknown Supergirl"?